Why not let an experienced plumber handle the toilet repairs for you? Toilet repairs don’t have to be a chore for you. Whether a faulty toilet flush, a rocking toilet bowl, or an installation of a new toilet you can rely on Handyman Near Me. Our skilled professionals’ versatile plumbing skills will come in handy when you to fix or replace the toilet in your bathroom. We will provide you with an excellent service when sourcing and curing leaks or unblocking the clogged pipes. Whatever the issue we will help you flush it out and enjoy flawlessly working toilet. 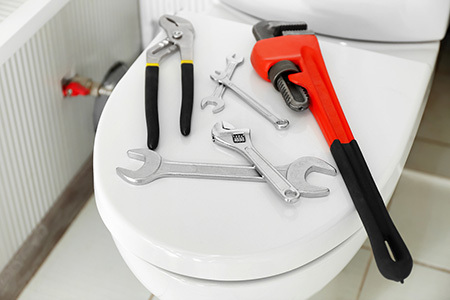 Enjoy efficient toilet repairs service and same-day bookings by the best plumbers in London! The proper fitting of pipes is an essential toilet repair work. Choosing the right size, as well as skilful assembly of the tubes is a guarantee for the flawless work of plumbing in your toilet. Our experienced handymen can replace old, leaky pipes or help fit the new ones when renovating your bathroom. We also offer a same-day booking to help you deal with emergency toilet repairs and replacement of tubes. Handyman Near Me provides professional installation of toilets in London. We will help you deal with this task and complete your bathroom renovation in a timely matter. You can book us for a scheduled or an emergency toilet repairs service. Our handymen will bring all the tools and equipment necessary to complete the installation of the new toilet. A slow-filling, noisy or faulty flush is quite an annoying issue. Problems with flushing can be a result of various faults in toilet or plumbing. The source can be a broken handle or button, a worn-out seal of the flapper valve, or an inconsistent water pressure. Whatever the problem, our expert handymen will source and fix it, leaving you with an adequately working flushing system. When the toilet is improperly sealed of just the sealant around it is old and worn out, this causes the bowl to move, often referred to a rocking toilet, and it is the most common sources of leaks in the bathroom. Our skilled handymen can caulk the toilet bowl and stop the leak. Still, a leak can be a sign of a broken pipe or a clogged drain. Whatever the source is Handyman Near Me will find it and cure the leak.